It was the Gold Rush, in small-town Osoyoos, set within spitting distance of the United States border. Smugglers, under the cover of night, bolted through the undergrowth, desperate to evade customs agents. And that moon, that cursed moon, shone full and bright. Those who were caught swore it was all the moon's fault for foiling their well-laid plans. They became known as moon cursers. I'm not sure whether it was the adventurous romance of that backstory, the bewitching artwork of its labels or the singular quality of the wine that first drew me to Moon Curser. But when I finally got to the winery itself, way at the end of the Okanagan Valley, its curse on me was complete. I was hooked. Back in 2013, at the Wine Bloggers Conference in Penticton, I first tried Moon Curser while on the "rustic" tour experience out in the deserts of Oliver-Osoyoos. It magically appeared again during the speed tasting segment. I loved this wine, I so wanted this wine. I could not get this wine, and pined over it when I left, empty-handed. 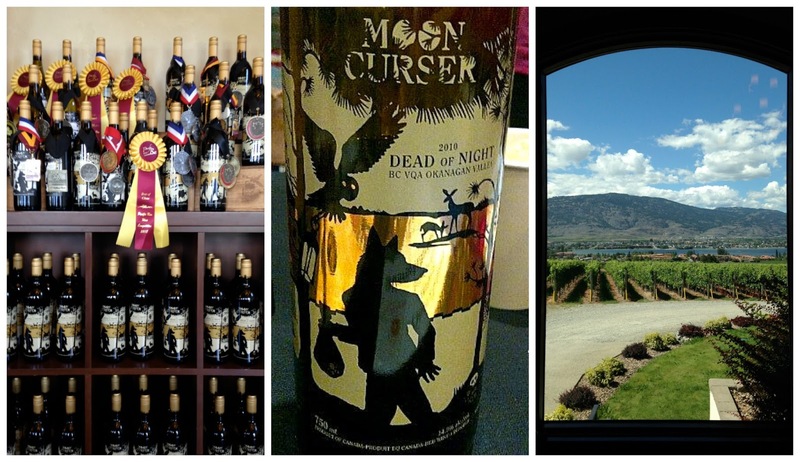 Now, here I was, road-tripping from Kelowna to Osoyoos with Hubby, and I'd be damned if I didn't get to Moon Curser. When we pulled up in front of the white-walled villa-style tasting room, I suppressed a giddy squee and did my best not to fangirl all over the place. After all, this was, to me, the equivalent of touring the palatial abode of a revered celebrity shortly before meeting them in the flesh. The WBC conference had offered me a taste, and a jovial back-and-forth over Twitter since then had kept my curiosity piqued, but this--this was the really real deal. There was no need to dash through darkened wilderness while mumbling profanities about that cursed moon; the shop was open for business in broad daylight and the staff welcomed us in with smiles and handshakes. The view was stunning, even after having spent the week surrounded by similar vistas. And the wines ... oh, the wines. Good thing we didn't have a schedule to follow; the afternoon slid by in wine-soaked splendour while we indulged in generous flights of red and white. Some of my favourites are below, but I suggest you seek out Moon Curser of your own accord and try them first-hand. Disclosure: Many thanks to Beata, the staff and admin of Moon Curser for their hospitality. Some of the following wines were provided as samples. 2015 Afraid of the Dark - Rhône-style blend of Viognier, Marsanne and Roussanne. Dry, light and airy, with a fragrant nose of banana, citrus and floral perfume. Crisp on the palate, it maintains its enchanting scent throughout. Contraband 2015 Arneis - Melon, floral, lemon zest. Medium-bodied with smoky muskmelon and sweeter Meyer lemon on the palate. Warm, tropical and spiced finish with a hint of ginger. Contraband 2013 Malbec - Single-vineyard, low production (only 200 cases). Surprising start to it, as the complex aromas bring to mind barbecued salmon. Segues into earthy, herbaceous notes accented by blueberries, cherry and smoke. Long-lasting, slightly tannic, dark berry finish. Contraband 2014 Tempranillo - Pinkish-ruby hues deepening to purple in the glass. Tried both the 2009 and the 2014 for comparison; the '09 was still holding up beautifully. Light-to-medium weight, the tannins slowly blossom on the tongue and linger, opening up with a warm, smoky flavour reminiscent of port-dipped cigarillos. Contraband 2013 Petit Verdot - An intense wine perfect for grilled game meat or brochettes. Blackberry and licorice up front, a bit of woodsy smoke before the peppercorn comes slamming through, all the way to the finish. 2014 Dead of Night - The one that started the love affair. Explosive ripe cherries, grenadine, violets and roses on the nose; bold, ripe, warm and peppery mouthfeel bordered by firm tannins. Looooooooooooooong finish. 2012 Tannat - Still too young to drink now, it's one for the cellar, or at least a half-hour of decanting. Teeth-coating peppercorn, green pepper and grilled meat from aggressive tannins. Tempered by juicy red fruit, then softening with Christmas cake spice. Finish lasts forever!